GARDEN CITY, NY (August 27, 2018) – Breslin Realty is proud to announce the recent grand opening of Doc Bressler’s Cavity Busters at 330 West Oregon Avenue in Philadelphia, PA.
Cavity Busters opened their eighth Pennsylvania location on August 16th, in South Philadelphia’s standout Whitman Plaza shopping center. They are occupying 3,450 square feet of the center. 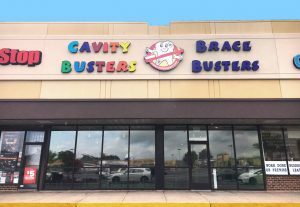 Cavity Busters is one of the largest children’s dental practices in Pennsylvania, serving infants, children, teens, and children with special health care needs. They provide an environment purposely designed for children that includes prizes, arcade games, and flat screen tv’s, throughout each location. Doctor David A. Bresler DDS founded Cavity Busters in 1982, which has grown to employ 38 dentists and over 250 staff members. The transaction was arranged and negotiated by Robert Delavale of the Breslin Organization. Additional Whitman Plaza retail includes ShopRite, Burlington Coat Factory, Ross Dress for Less, Blink Fitness, Pet Valu, PennDOT, Party City, Citizens Bank, Rainbow Shops, GameStop, GNC, Payless Shoe Source, Dunkin Donuts, Sally Beauty Supply, Sneaker Villa, Flaming Grill & Supreme Buffet, OneMain Financial, and more. For further leasing inquiries, please contact Robert Delavale at (516) 741-7400 ext. 230. Breslin Realty Development Corp. develops, leases and manages properties occupied by a successful mix of national, regional, and local retailers. Since 1953, Breslin Realty Development Corp. has grown from a small retail brokerage office to a multi-faceted commercial real estate company with extensive expertise in land planning, development, tenant relationships, landlord representation, real estate appraisal, creative financing, property management, and construction. Today, the company manages a portfolio of commercial properties totaling over ten million square feet.